The saying “never judge a book by its cover” may hold true for many life events, but this rarely applies to commercial and institutional buildings. When a building’s exterior is dirty, it turns away would-be customers or tenants in droves. 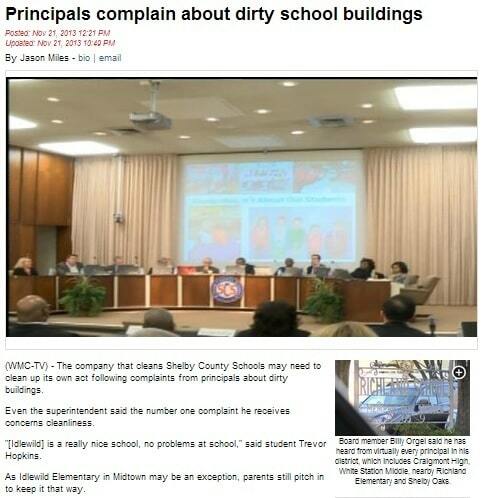 Unfortunately, the students of Shelby County Schools cannot walk away from their schools despite the dirty exteriors. It thus falls in the hands of school administrators to ensure the clean-up of the buildings. Writer Jason Miles reports on the situation for WMCTV.com. “Dirty schools were discussed during Tuesday night’s work session. Board member Billy Orgel said he has heard from virtually every principal in his district, which includes Craigmont High, White Station Middle, nearby Richland Elementary and Shelby Oaks. Superintendent Dorsey Hopson said cleanliness also tops the list of issues shared with him. While the need for a clean building is enhanced in schools where young students are involved, it is nonetheless important in other facilities as well. For example, a commercial establishment like a restaurant or a hotel will certainly not attract the right kind of customers with a dirty exterior. Unclean office buildings can send the wrong message to the business’ clients and lead to a low morale among employees. Admittedly, keeping a building’s exteriors clean is not an easy task. It requires a lot of manpower and the right equipment to get the desired results. For this reason, business owners and building managers in Nashville and other places in Tennessee will do well to rely on Nashville pressure washing services like Pro Wash. These professionals employ the right equipment to do the job more effectively, including pressure washers powerful enough to get rid of the toughest dirt and stains on walls and floors of any surface type. They may also make use of cleaning chemicals that could be hazardous to humans if not handled properly. Another possible consequence of poorly maintained commercial exteriors is a lawsuit arising from a slip and fall incident caused by a sleek surface, or obstructing debris. Likewise, when mold and mildew form and cause illnesses on those exposed to them, building owners may also be held accountable. This further highlights the importance of Nashville, TN pressure washing professionals. If scheduling is an issue, reliable services can work on off-times when a building is minimally occupied. Students of Shelby County Schools will not need to miss on their regular classes, as the pros can do their work on weekends, if necessary.